Reigning Wentworth Park leading trainer; Anthony Azzopardi recorded a clean sweep of Wentworth Park's Group racing on Saturday night, taking out the Group 1 Ladbrokes Paws of Thunder (520m) and Group 2 Summer Plate (720m). Azzopardi, who is soon to move to Victoria, started the night in strong fashion recording his first win for the night in the National Derby prelude, with Il Bacaro saluting from box one. With Zambora Brockie the race favourite, Azzopardi looked to be the one to beat. It was kennelmate Asa Flying Spur however which recorded the 29.83 victory, to pocket $75,000. Asa Flying Spur led throughout, with Elfen Bale holding in for second, while the well supported Smart Missile finished in third position. Azzopardi then followed up the 75-grand Ladbrokes Paws of Thunder win, with race favourite and new comer to the kennel, No Donuts taking out the Group 2 Summer Plate. Coming off a Group 1 win in the Sale Cup in December, No Donuts recorded BON figures in the qualifier the week prior. Jumping smartly in the $40,000 to the winner Summer Plate, No Donuts was able to stay a stride in front of Whittaker throughout, who was gallant in defeat. Stopping the clock at a PB of 41.97, No Donuts won by 1 3/4lengths over Whittaker, with Porrentruy finishing in third. Taking out four wins for the evening, including the two Group Finals, Azzopardi said it was a highlight of his career, and a credit to all involved with Moneyshot Lodge. "I am lucky to have such great owners, that give me an opportunity with very talented runners," Azzopardi said. "I can't thank the owners and also the team which support myself and my family in doing what we love. "Depending on how Asa Flying Spur and Zambora Brockie both check over in the morning, we will at this stage head to the Derby with both dogs as well as Il Bacaro who won the prelude tonight," Azzopardi said. 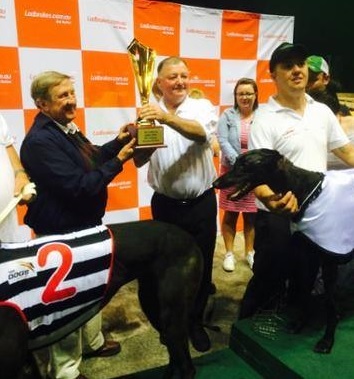 In a big night of racing at headquarters, the 10 race card also featured the running of the $15,000 to the winner Collerson; a Paws of Thunder consolation; named in honour of legendary greyhound journalist Jeff Collerson. Time honours for the listed event when to Nangar Flash, for Dennis and Ann Barnes of Cudal. Recording victory in 29.92, Nangar Flash beat home a strong finishing Bessy Boo and Pedro Cerrano to the joys of the Barnes family cheers. Nangar Flash is also expected to line up in next week's Group 1 National Derby heats. Wentworth Park will have five heats of the Group 1 National Derby & Futurity next Saturday night (January 23); which is expected to be a sensational night of young star racing.